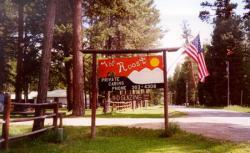 The Roost Cabins are located in the scenic little town of Lincoln, Montana. We offer 5 cabins, opened year round, and each cabin is equipped with a stove, refrigerator, shower and toilet. We are less than 1/4 mile from the Blackfoot River on Stemple Pass Road. Deer are seen daily roaming through our area. Lincoln is approximately 60 miles from Helena, Montana's State Capital. For more information on our cabins , please call or write: The Cabins Roost, 231 Stemple Pass Road, Lincoln, MT, 59639. 406-362-4308. Directions: The Roost Cabins are located 2 blocks south off Highway 200 on Stemple Pass Road.